All prices include First Class Shipping to the USA! 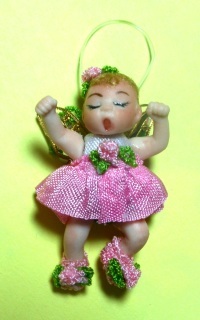 Joseph, Mary and Baby Jesus are made of porcelain body pieces as most miniature dollhouse dolls are. 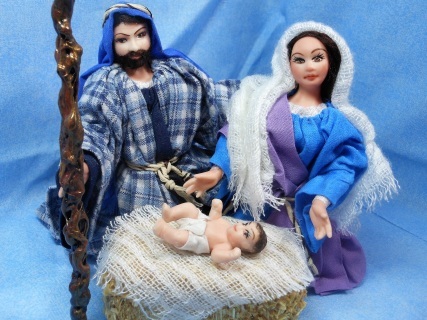 Joseph and Mary were made to be kneeling in front of their precious baby boy. Baby Jesus is wrapped in a cotton diaper and laying on a white blanket atop a bale of hay. He can be removed from the ‘bed’ and held in Mary’s arms if you like. Joseph and Mary both wear sandals on their porcelain bare feet and are both gently poseable at their shoulders and elbows. Their clothing has been gently treated to help their rayon/cotton robes, shawl and head wraps to remain draped as needed. 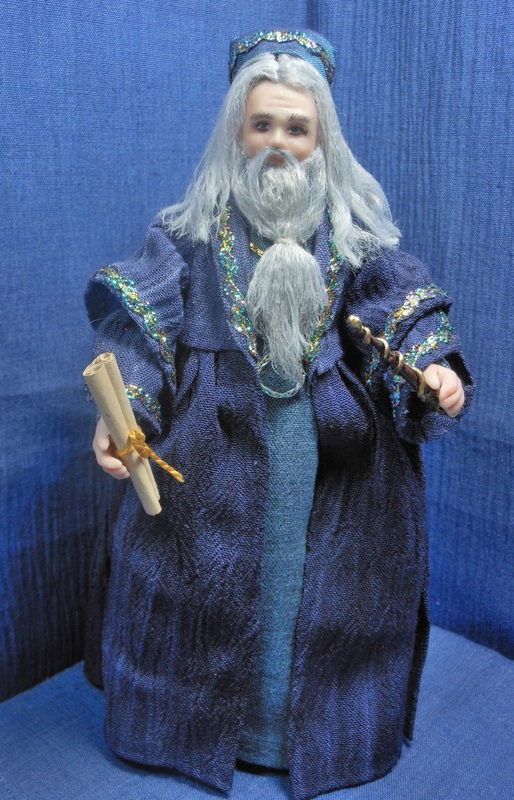 A wizard of learning…Belvin the Scholar is dressed in royal blue robe with pants underneath made from the same fabric. The front has a lace overlay on the breast. The over-robe is made of some wonderful crinkle satin crepe fabric in blue/black tones and trimmed in gold and iridescent threads. His hair and beard are gray. His shoes are painted black. Belvin the Scholar stands around 6” tall. Here we have a wonderful couple…Father Christmas and his Mistress. They are dressed in lovely deep plum (purple) colored baby wale corduroy and white trims. Father Christmas is wearing his pants and mid-calf length coat with a black faux leather belt and gold buckle around his waist. His coat and pants are trimmed with a beautiful velvet fur trim in white. He wears his plum stocking cap over his head of white hair and it has a tiny purple bell on the end of it. He has on gold colored glasses and wears black painted boots with two tiny gold buckles on them. 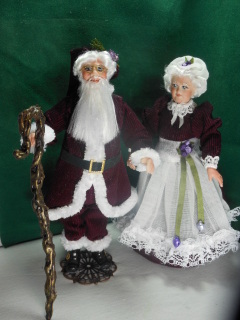 Father Christmas is gently poseable at his shoulders and neck and he stands nearly 6” tall. His wife is dressed in a matching gown of deep plum colored corduroy trimmed with white lace collar and cuffs. She also wears white stockings, pantaloons and a white cotton slip under her gown. Her shoes are made of the same fabric as her gown. Her white apron is trimmed with delicate lace and handmade two tone purple roses in a cluster with a green silk ribbon trail topped with two tiny bells of purple and silver in the front and ties at the back with a large white bow. Her lovely white hair is covered by her mob cap that has three more tiny purple roses on it. She is gently poseable at her shoulders and elbows. 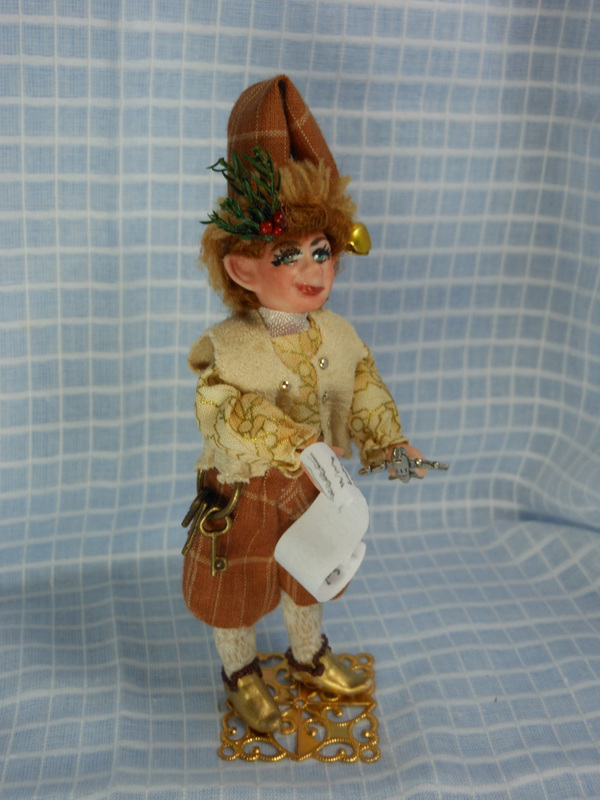 Crispin Elf is a 1/12 th scale handmade porcelain miniature doll. He is wearing a red/white long sleeve shirt and two toned striped green pants. His red velour vest has four tiny buttons down its front. His hat is made from the same velour fabric as his vest and crowned with some nice furry white trim. Crispin's hair is a curly light auburn color. 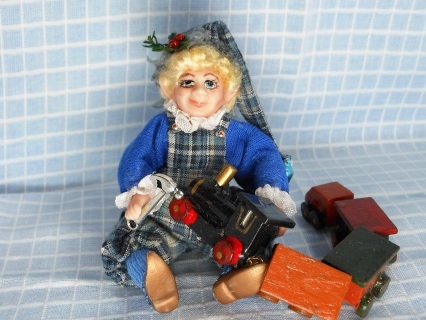 In his cute little hands he holds a tiny metal tractor that has a red silk bow on it and a pair of ice skates tied with another red silk bow that is ready for packaging. Crispin is gently poseable at his shoulders and elbows. He stands around 4 1/2" tall including his hat height. This sweet little girl is dressed in a silky white gown with lots of red bunka roses on it. On her back she wears a set of golden wings with more roses. 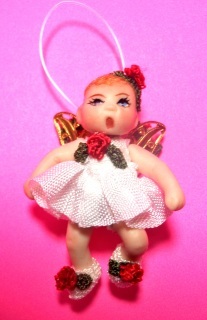 She is attached to a hanger so you can use her as an ornament or put her on a suction cup with a hanger and put her on your computer screen or a window where you will enjoy her more. She is gently poseable at her neck, shoulders and hips. Layne Elf is a sweet little smiling elf that is very busy making toys for good little children on his assembly line at the North Pole. He carries a hammer in his small right hand. At the moment, he is working on a tiny wooden train that is included in this auction. He is wearing a royal blue long sleeved shirt trimmed with a white ruffled collar and white ruffled cuffs. His pants are made of a beautiful plaid blue/tan cotton fabric. He wears a hat made of the same fabric as his pants and has a tiny bell on the end of it. Layne wears a real twig of greenery with small red beads (berries) on his hat band. He wears golden elf shoes with medium blue hose. Layne has pale blonde curly hair under his cap. if he were standing, he would stands around 3 ½” tall. He is gently poseable at the shoulders and elbows as well as his knees. 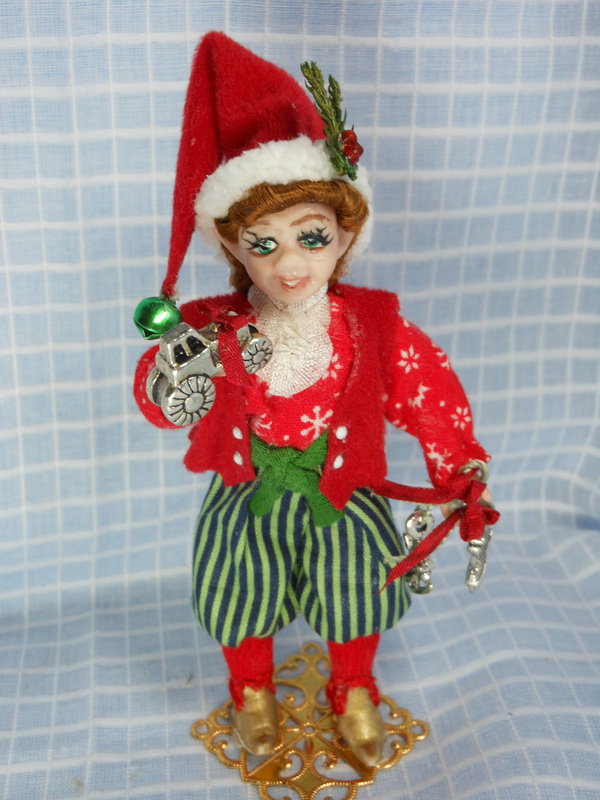 Eliot Elf is a 1/12 th scale handmade porcelain miniature doll. He is wearing a beige/gold long sleeve shirt and plaid brown and tan pants. His cream colored vest has six tiny buttons down its front. His hat is made from the same cotton fabric as his pants and crowned with some nice furry light brown trim. Eliot's hair is a curly light auburn color. He wears a set of keys on his waist at his right hip. In his cute little hands he holds a list of toys that need to be made and an airplane that is ready for packaging. Eliot is gently poseable at his shoulders and elbows. He stands around 4 1/2" tall including his hat height. 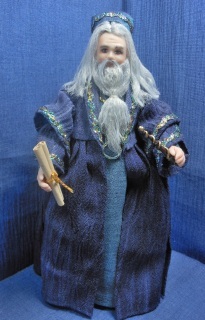 A wizard of charm…Zanlannan the Chosen One is dressed in a light blue robe with pants underneath made from the same fabric. 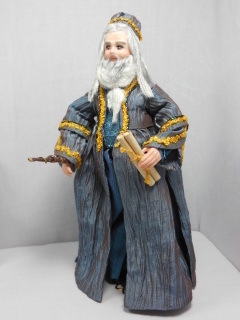 The front of his robe has a design of iridescent threads over the breast. The over-robe is made of some wonderful shaded crinkle cotton fabric in blue tones and trimmed in iridescent threads. His hair and beard are gray. His shoes are painted black. Zanlannan the Chosen One stands around 6.1” tall including his cap. This darling little imp is dressed in a silky white and pink gown with lots of pink bunka roses on it. On her back she wears a set of golden wings with more roses. 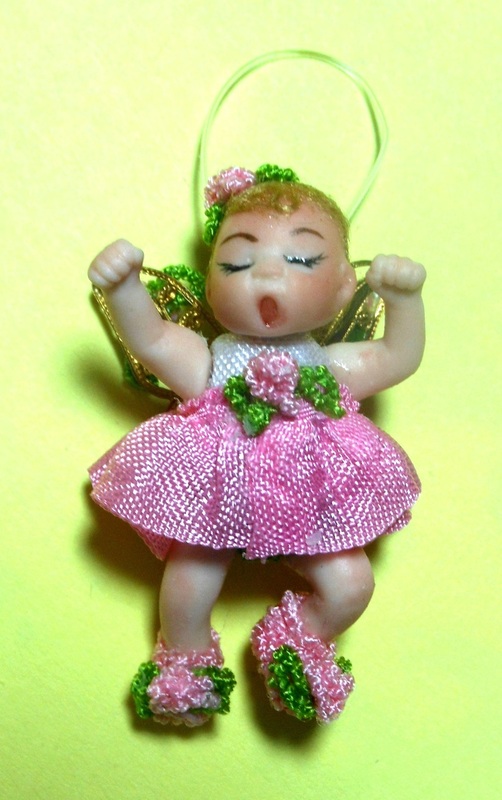 She is attached to a hanger so you can use her as an ornament or put her on a suction cup with a hanger and put her on your computer screen or a window where you will enjoy her more. She is gently poseable at her neck, shoulders and hips. Kyndra is a sweet young girl elf who is working in Santa’s toy shop. She is wearing a long sleeved blouse of knitted green, orange, blue and white stripes. Around her neck, she wears a winter white ruffled collar and ruffled trim at her wrist. 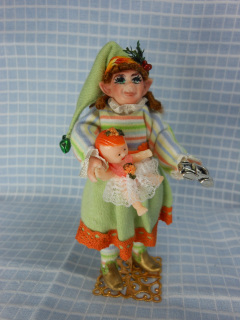 Her skirt and hat are made of knitted light green fabric to match the green stripes in her blouse and trimmed with orange lace and an orange flowered belt. After all, elves work year round and don't always have to dress in Christmas colors. She also wears the same knitted fabric as found in her blouse for her tights and a lovely white cotton slip and bloomers under her skirt. Kyndra wears gold shoes on her sweet little elven feet. She has light brown curly hair. 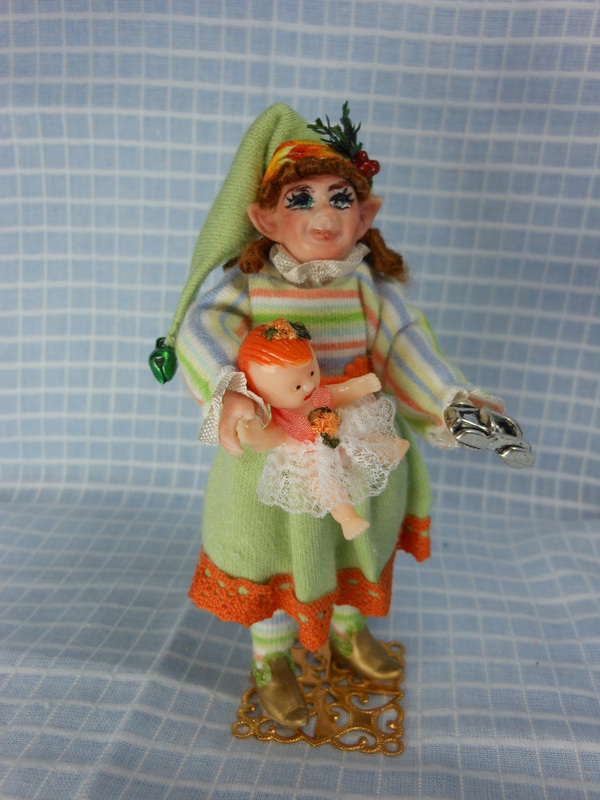 She is holding a baby doll and a tiny shiny silver car in her dainty hands as she takes them to be wrapped up for some lucky child for Christmas. She stands around 4” tall including her hat height and is gently poseable at the shoulders and elbows. Santa is on his way! He is wearing his traditional outfit of mauve (deep red) baby wale corduroy pants, coat with cape, and long pointed cap all trimmed with white faux fur. His boots are painted a shiny black and have gold buckles on them. He also wears a black leather belt with a nice golden buckle on it. His mustache, beard and hair are all a lovely shiny white. He comes with his red sack that represents those that he carries on his sleigh filled with toys for all the good little children. (It can be gently removed if so desired.) In his left hand he is carrying a pipe. He wears a twig of greenery on his hat band with faux red berries on it. His golden glasses are firmly on his nose. 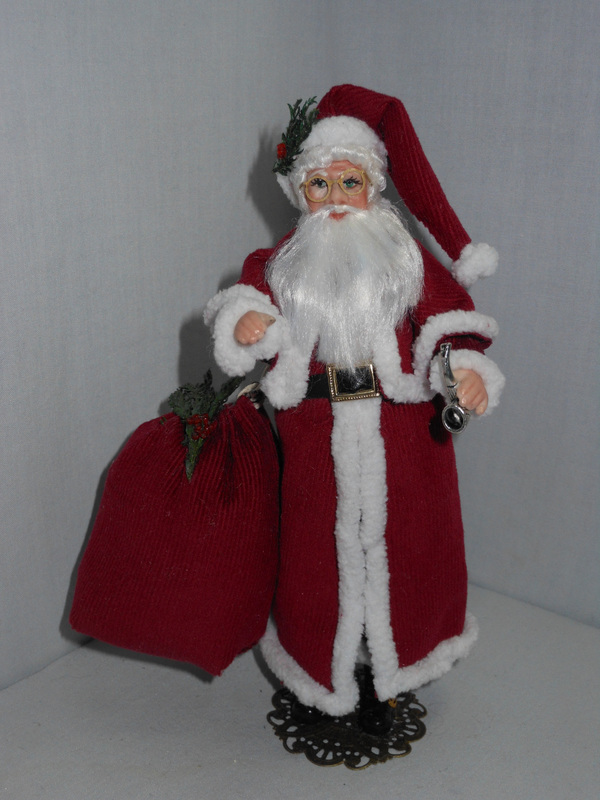 Santa stands a little over 6" tall with his cap and is gently poseable at his neck and shoulders. A faux wooden staff will be included with him.